One of my favorite hobbies is belittling California fresh-hop ales. And I had a couple of posts this summer slamming expensive California sour beers that lots of other beer nerds think are hot stuff. So I'm happy to be able to give a good review of a California fresh-hop offering that I tried a few weeks ago: High Tide IPA from Port Brewing. Port isn't distributed in Oregon yet, but it can be had at By the Bottle just ten miles north of us in the 'Couve (thanks to Charles for saving me the trip and bringing me a bottle of High Tide). I'll keep saying it until I sound like a parody of myself: there's no point in making a fresh-hop beer if it doesn't have the green flavor of truly fresh-picked hops. Thankfully, High Tide does indeed have that wonderful flavor. It's a big IPA, and also has a very bitter finish, which suits me just fine. 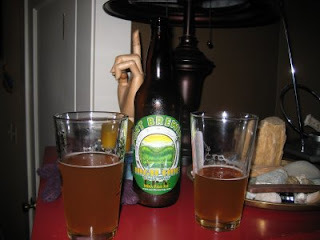 The bitterness reminded Dave of dandelions -- it was really that bitter -- but to situate it in the Portland beer world, I'll say that High Tide reminded me favorably of the Mt. Rainier variant of John Harris' Lupulin Ale this year, which had a similarly bitter edge. That wasn't my favorite Lupulin, but it's still a great fresh-hop beer, so a comparison like that is high praise in my book. It's getting past fresh-hop time; for all I know High Tide is no longer available. But if you find yourself in Vancouver, you'd do well to pop into By the Bottle and bring home some of the other Port Brewing beers. Labels: california, fresh hop beers, retail, where do I find...? You're welcome Bill. I'm glad you enjoyed the beer. It was tasty! Thanks, Charles. You going to Roots tonight? Ah, yes, the infamous sour beers or California, manufactured by evil pranksters who turned to the dark side after dropping out of Clown School. Yes, but Po, the clown beer you had here was unfortunately homegrown: the Dissident by Deschutes. I've always been a big fan of Port's Wipout IPA. I'll have to give the High Tide Fresh Hop a try when I find myself in the Couve.